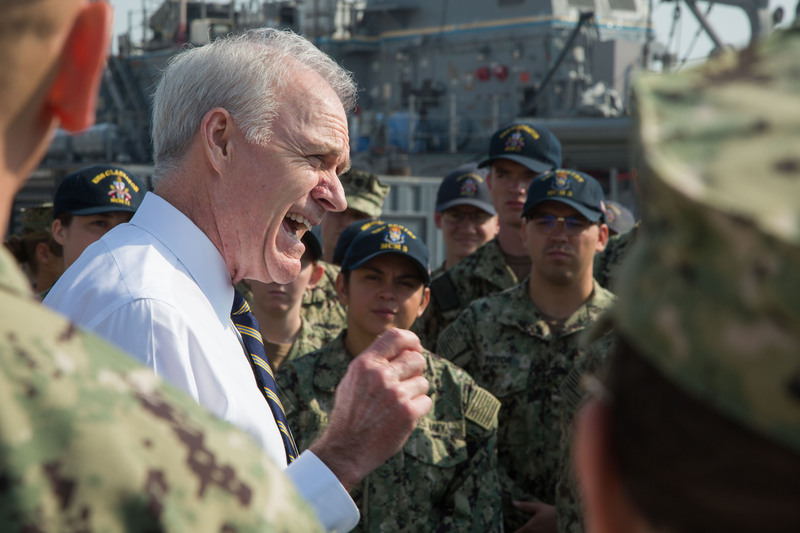 ARLINGTON, Va. – With increasing threats abroad and anticipated tighter defense budgets ahead, Secretary of the Navy Richard V. Spencer will spend 2019 instilling a sense of urgency into how the Navy and Marine Corps operate. Since taking office, Spencer has focused on training, capabilities and the way the Navy and Marine Corps invest resources. Now, a year and a half on the job, the lethality of the force is better, but sailors and Marines must pivot to embrace change, Spencer said during his keynote address at the 2019 Surface Navy Association symposium. The Navy and Marine Corps are in the second half of a two-year budget passed by Congress that significantly increased funding for weapons purchases and personnel recruiting, training and retention. However, the Fiscal Year 2020 budget approval process is about to heat up with no guarantee of funding at the same level of previous Trump-era budgets and foreign adversaries are not waiting for U.S. forces to improve, Spencer said. The Department of Defense FY 2020 Budget is expected in February. He challenged the attendees, especially those in uniform, to be creative when considering acquisitions. Spencer wants industry and active duty program planners to work together to keep costs in check when developing new capabilities. “We need a sustainable path to support the way we’re going to grow, and a lot of that is going to have to come from us because it’s not going to come from Congress,” Spencer said.